Badger culling: should it continue? Badgers are one of Britain’s finest native creatures and we are fortunate enough to host one of the largest species populations in Europe. As nature would have it, the badger’s nocturnal lifestyle means it is seldom seen and appreciated in the wild, only venturing from the sett to feed after nightfall. This is a crying shame, made worse by the fact that the blanket slaughter of British badgers (to contain the spread of Bovine Tuberculosis in cattle), is leaving us with nothing but their carcasses to look at. Sadly, because badgers have been implicated in Bovine Tuberculosis transmission – something which has caused panic in farming communities as the infectious disease is easily transmissible to cattle – culling in ‘hot spot’ areas has become something of a sport. The disease also affects other non-bovine animals including pigs and sheep, as well as several species of domestic animal (cats and dogs included), but the fact the culling has so far only extended to badgers indicates they are the biggest culprit. Or does it? Last year, pilot badger culls involving ‘free shooting’ took place in Gloucestershire and Somerset where badger populations are particularly high. The aim was to show that 70% of badgers could be humanely killed within 6 weeks. In fact, the trials were a complete disaster, proving only that a handful of animals could be cage-trapped and shot at. While the incidence of bTB in cull areas was reduced by a small extent, the incidence outside the cull area increased as the territorial nature of badgers drove the surviving animals further afield. The culls were neither humane nor effective, and subsequent findings suggested that in some cases, badgers were incorrectly shot, taking up to 10 minutes to die." Understandably, many people were upset that this had been allowed to happen. Besides their obvious concern for animal welfare, they also questioned the likelihood of bTB posing a real threat to humans and whether the action to kill the animals, rather than vaccinate them, was warranted. Badgers are one of the most legally protected wild animals in the UK, coming under the Protection of Badgers Act 1992, and the Wildlife and Countryside Act 1981. Therefore, many argued that widespread culling was both unethical and illegal. But there was of course a motive behind the free shootings. Bovine Tuberculosis poses a very high risk to cattle and is one of the biggest threats facing the farming industry today. It is estimated that £30,000 is the average cost to a UK farmer of TB breakdown in a herd - a significant amount that takes into account the compulsory slaughter of cattle, costs of testing and loss of income. If TB were to enter the food chain, an outbreak of TB in the human population could be catastrophic. For public protection alone, the Government has wanted to pursue a heads-on approach to the issue, despite facing fierce opposition from the pro-badger community. Their main argument: badgers are NOT to blame. It is cattle to cattle transmission that poses the real threat. Between 2008 and 2013, over 220,000 cattle have been culled because of bTB infection. Of this number, roughly 94% are thought to have contracted the disease from other cattle (this usually happens when cattle inhale the bacteria given off by the urine or faecal deposits of an infected animal), although this is subject to speculation. If left unmanaged, the cost of bTB to the British taxpayer over the next decade is predicted to push £1 billion. Facing a similar crisis in New Zealand in the 1990s, the government made the decision to cull the common brushtail possum, the main vector for bTB transmission. As a result, the country saw a 94% reduction in cases of TB. This would suggest that culling can be effective, surely? Simple science suggests that culling can actually increase the prevalence of disease amongst badgers and in turn, lead to more cattle becoming infected. This is known as the 'perturbation effect.' As some of the infected badgers are killed off, the remaining badgers roam outside the cull zone, spreading TB to non-infected hosts. While this does happen, it is more often the case that outside badgers move inside the cull zone to take advantage of abandoned territory. 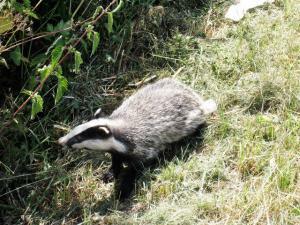 More animals are brought in, meaning more badgers quickly become infected. If blanket culling continues, the perturbation effect is only going to get worse. But what are the alternatives to culling? While many people are up-in-arms over a proposed extension to the strategic slaughter of more British badgers because they believe it to be inhumane and ineffective, the fact that a BCG vaccine (for cattle and badgers) costs less than it does to shoot an animal, is something that has prompted additional outrage. At face value, the cost of badger vaccination per square kilometre per year exceeds that of culling over the same area and time period, but when you take into account policing costs (i.e. from protests against culling), vaccination is the far cheaper option. As badgers are nocturnal and only feed after dark, cage-trapping a badger to administer a vaccination is just as difficult as cage-trapping a badger to shoot it. Therefore, localised vaccination is considered by many the more effective method of defence against TB, without any potential for perturbation. Another way of safeguarding cattle from the potential spread of disease is by maintaining biosecurity (good husbandry) and employing precautionary measures along with common sense where possible. Making sure cattle feed is inaccessible to badgers is the first step towards securing your farmyard as badgers will be attracted by feed and are therefore more likely to contaminate it. As badger latrines are the biggest breeding ground for TB transmission, keep cattle away from these high-risk areas and avoid badger setts when putting your cows to pasture. If you suspect an outbreak of TB or that one of your animals has become infected, isolate it from the rest of the herd. Cattle to cattle transmission is much more common than badger to cattle transmission, so it is essential that animals are separated as soon as a TB outbreak is suspected. I think it is atrocious that humans are allowed to kill our native animals because they think they have the right. I strongly believe vaccination is a better alternative. As the secretary of a badger protection group, of course I am against the badger cull. There is another angle to the problem. It appears that a few people who have heard about the cull but have not fully understood how it is being done, now believe that it is open season on badgers everywhere. We've got the "They are shooting them in the south west, so we can here." attitude. Please stop this terrible culling they are such beautiful creatures. The thought of the culling of badgers, literally makes me feel sick.... It is a terrible inhumane way. Badgers are made to suffer pain and agony, when not killed with a first shot. Or battered with clubs etc as we have seen on the news in the recent past. Please, please fight for the vaccination.... Why should we lose our wildlife!! We'll hear they're becoming extinct next. I think its pathetic how we protect our native species. I think the people who authorise the hunting of badgers to their extinction with bTB has not yet been proved. During this cessation period a lot more information gathering can be done with how quickly the population grows as well as any illness that are within the sett. Getting the farmers onside would help a great deal. Perhaps a moratorium on shooting and laying out traps should be considered an act of cruelty and punishable by prison or heavy fines if caught. The statement at the bottom of this article is very true: Last year the DEFRA Chief Scientist Ian Boyd told an NFU hosted TB policy conference last year, only 6% of TB infections in cattle are due to badgers, the other 94% is due to cattle to cattle disease transmission and this is where urgent action needs to be taken to get control of bovine TB. So why is the government continuing to cull a native creature when it is, by far, not the main culprit? What possible reason do they have not to deal with the 94% that are REALLY causing the spread of the disease? It beggars belief! I believe that the cull should stop immediately , why do humans think they have the right to kill anything that supposedly poses a threat when in fact it's the cattle that have caused the problem but we don't go round shooting them . Vaccination is a far better solution , it's more humaine and allows these beautiful animals to live out there lives naturally , culling is cruel , barbaric and completely unecessary . It should be stopped NOW !!!!! Vaccination process should be implemented a.s.a.p. & Badger culls ceased . It upsets me deeply to know that badgers are being shot inhumanely and needlessly. Wouldn't it make more sense to invest in a vaccine? And now that people are allowed to shoot babies in the setts, imagine what the parents go through when they return. This sort of suffering belongs in the Dark Ages and it needs to stop. I did email my MP about this before the vote but he voted for the cull anyway. If we can vaccinate chickens for salmonella, we can vaccinate cattle for TB. I have always been against badger culling. The word itself is an effort to lull the public into mistakenly thinking it is a humane and necessary procedure. For 'culling' read 'killing'. Both cattle and badgers should be vaccinated. Badgers are a protected species, aren't they? That makes it even more despicable to kill them. Vaccinating badgers won' t stop cattle getting bTB but it will protect the young, disease free from getting it. Hence it should be used in the EDGE or fringe area to prevent badger TB from spreading any further N & E. However, there isn't the manpower or money to achieve even that. Targeting the cull in the hotspot areas where badger numbers have increased by 10x over the last 30 years is a very sensible approach.